There is a lot of information about stress, relieving stress and stress management. From meditation to diet, from time management to journaling. Where does a mother begin to pick how to break her stress cycles naturally? Stress follows a cycle of events which circle around and around, each step increasing the severity of the next step. To break the stress patterns, you can interrupt the cycle at any point. Some people find one link easier to stop than another. The most complete stress management program will not rely on just one technique, but a holistic approach which encompasses it all. Often stress management begins with the stressor–the thing that causes the stress. From work deadlines to sick relatives, if only you didn’t have the stressor in your life, you would be fine. But of course, life will always have stressors. There are many ways to reduce stressors, from avoiding them to managing them. Often these techniques involve choosing what is important in life. From time management to simple living, from changing jobs to learning to say “no”, many mothers will actively work to reduce life’s “controllable” stressors. Once there is a stressor, the next step is our reaction to it. What is a major calamity to one person is no big deal to another. Your reaction to stress begins with how you perceive it emotionally. Many religions seek to give helpful advice to control you reactions. From asking God for help, to understanding how we are all one, spiritual advice tries to reduce the feeling of helplessness and of being out of control. Feeling protected can make stressful situations feel less dangerous. If you do feel stressed from the stressor, you body begins a huge chemical change to prepare yourself to confront the stressor. Many techniques try ways to change your reactions to stress. Cognitive-behavioral therapy is a good example of this practice, as well as simple reframing, affirmations, and visualizations. Spiritual practice can also break the stress cycle by changing your reactions to stress. There is a lot of information about stress and its effects on our body. When you become stressed, if you do not correct the stressor, the same stress reactions which at first helped you to cope, will now begin to wear you down. The chemicals that you release when under stress are not meant to be in your body long term. Without rest, your body and emotions will not function well, and set the stage for disease. This is an excellent place to use natural stress relief. Everything from tight neck muscles, headaches, exhaustion and irritability to adrenal fatigue, increased colds and insomnia can be alleviated and controlled with natural stress management. Try improving your diet, increasing your exercise (but not if you are already very active–cortisol levels increase when training hard), or starting yoga. Aromatherapy, herbal supplements, and Bach flower remedies can all help both the emotional and physical effects of stress. After a sustained period of chronic stress with little or no relief, your body will wear down. This can invite more serious diseases like high blood pressure, heart problems, diabetes, skin conditions, asthma, arthritis, depression and even cancer. Many, many diseases are associated with high chronic stress. Again, you can use natural stress management to address these problems, but this time it is more serious. You must not only support your health, but also rebuild it. Consult with your homeopath, acupuncturist or naturopath to make a plan for regaining your health. Breaking the cycle of stress at this point requires a diligent effort. While your body is wearing down and fighting disease, and your emotions are worn and exhausted, your sensitivity to stress increases. This is why people “fly off the handle” at very small events. Overtime, a smaller and smaller stressor will initiate the same stress reaction that a big event used to get. At this point, you may hear yourself talking about how overwhelmed you are; you may be fighting depression. Sometimes women have marriage difficulties, or their position at work may be at risk. Even supportive friends may become distance because of your overreactions. Natural stress relief will again look to ways to reduce your reactions and sensitivity. You may try deep breathing or mediation. Taking walks or talking with an objective friend may help reduce your sensitivity. And the cycle continues on but this time a level 5 stress gets a level 6 reaction because you’re already primed for stress. Most information about stress offers advice to beat one or two of these steps. To truly gain peace, you need to master all of the steps so that your body, mind and emotions are at peace and content. Start where can and build from there. There are many stories about premature graying under stress, but is there a direct link? Does stress cause gray hair? Experts disagree but there are many ways stress can contribute to it. Tyler Cymet a scientist from Sinai Hospital (Baltimore) has studied the connection between gray hair and stress. Cymet agrees with other experts that the old myth of going gray overnight is indeed a myth, but he parts company with experts who believe gray hair is determined strictly by our genes. The cells that produce hair pigment (melanin) die with age, causing our hair to turn gray or white. 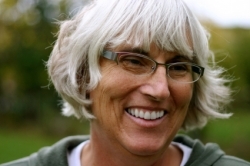 Gray hair still has some melanin, while white hair has no pigment at all. Cymet believes that long-term stress may hasten this normal aging process. Stress makes hair shed more quickly than normal, causing pigment cells to wear out more rapidly than they would otherwise. Cymet even thinks that the stress of modern living is making most people go grayer sooner than might have a generation ago. He estimates that people now go gray five years earlier than people did in 1970. Why does Stress Cause Gray Hair? There are many theories about how stress and gray hair are related. Some suggest that chronic free radical damage contributes. Stress hormones can cause inflammation and this increases free radicals, unstable molecules that damage cells. It could be that free radicals decrease the melanin production. Eastern healing systems have a somewhat different perspective on stress-related gray hair, than the traditional Western medical approach. In Chinese traditional medicine premature gray hair is considered related to an imbalance in the kidneys and the blood. One of the main concepts of Chinese traditional medicine is the concept of qi-energy that flows through your entire body. Stagnation of qi can lead to kidney and blood problems. While Chinese traditional medicine offers no medicine to reverse gray hair, it is thought that strengthening the blood and kidneys may stop premature graying. Black strap molasses, black sesame seeds, nettles, Hijiki seaweed, wheat grass, and chlorophyll are given to strengthen to the blood and kidneys. If you are considering increasing your seaweeds as one of your gray hair solutions, exercise caution. Seaweed contains high amounts of iodine; iodine is necessary for thyroid health, but too much can lead to thyroid problems (one symptom of which is premature graying). Sometimes it’s hard to win! Ayurvedic medicine, practiced for five millennium in India, also sees premature graying as an imbalance. Various Ayurvedic herbal remedies are recommended for this imbalance as well. If your hair is already turning gray from stress, what do you do? Stress-related gray hair solutions has some tips for you. Humans have always lived in a world with stress, and our bodies are adapted to deal with stresses. However, through evolution, our bodies are most suited to deal with acute stressors, not chronic stress. And because of this quirk, our modern life which sustains stressful situations for long periods of time, creates lots of chronic stress related disease. When we humans were more controlled by our environment, we developed a marvelous and quite miraculous system to survive. This is called our “Fight or Flight” response. In general, a threat, such as a lion or a troupe of enemies armed with pointy spears, would trigger a series of chemical events which ready our body for immediate fight or immediate flight. It worked great. Now our dangers are, well, less “pointy”. A really surly boss does not pose the same threat as a mammoth and fighting or fleeing is not necessarily the most beneficial or the most productive solution. And while meeting a deadline at work would appear to be directly related to survival (not losing your job which pays for your food), as say, killing the deer, the fight or flight response is still a tad inappropriate. So our bodies have yet to catch up with our modern life. Or better yet–we have yet to learn how to use our bodies to our advantage in modern life. Some people use stress to gain peak performance. This “good” stress, which enhances your abilities instead of disabling them is called eustress. When in peril, your body mounts an immediate response to prepare for action. Your breathing and heart rate increase, your blood pressure goes up, your pupils dilate (to see the threat), and you begin to sweat (to cool the body for the coming battle). At the same time, the brain starts excreting hormones like mad, to coordinate the muscles, nervous system, and endocrine system so that you are at peak performance. Digestion ceases and your energy is diverted to your muscles. After the threat leaves, all of this reverses itself, and your body goes back to a relaxed state. You eat the deer and talk about how brave you were fighting the lion. Everyone laughs and you go to bed happy. But in our modern world, our stressors do not have finite end. After the surly boss leaves and you get a call about a new deadline. When you hang up, the school nurse calls and you must pick Jimmy up from school. You stop to get dinner as you go home; you have a fight with your teenager about homework; your ex calls to change plans for the weekend. You go to bed angry and worried and get up the next day to do it all again. Your heart raced all day, your blood pressure was up and your hormones were nuts from all the stressors, real and imagined. Hans Seyle is the Father of Stress Research–much of our understanding of chronic stress begins with his research. This constant state of stress arousal leads to General Adaptive Stress, or GAS. Our nervous system has two parts to it. The somatic manages the body’s movements and processes external stimuli. This is under our conscious control. 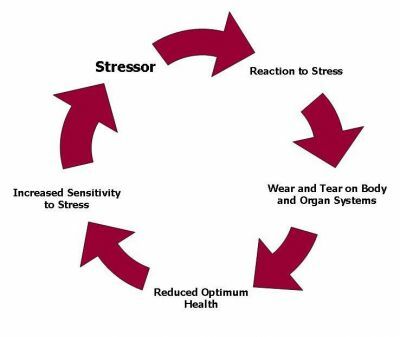 The autonomic system functions in the background of our consciousness, and this is what functions during stress. There are three parts to the autonomic system. The sympathetic system is in charge of emergencies. The parasympathetic is in charge of resting, relaxation, and “normal” metabolic function. The entericsystem manages digestion. To understand stress, the relationship between the sympathetic and parasympathetic system is important. Our sympathetic nervous system switches on in emergencies. It keeps us acute and ready for action. It is yang, energizing, active, aroused and short term oriented. The other part of the automatic nervous system is the parasympathetic system. This is yin, calming, and soothing. The parasympathetic system has a long term view for growth, maintenance, and health. It should be operating most of the time. Chronic stress is when we operate in the sympathetic nervous system long term, without end. This never ending “alert” is called General Adaptive Stress. There’s an alternative stress reaction: “Tend And Befriend” and mothers do it naturally. 1. Alarm– This is the initial fight or flight stage. The body readies itself for action. The hypothalamus in the brain activates the hormones, especially the adrenal glands. Steroids flood the blood. The heart begins beating faster and the bronchial tubes dilate to increase breathing. The liver releases sugar into the blood. 2. Resistance– If the stress continues, we enter resistance phase. This stage is tricky because from many indicators, our body adapts to the stressor and we appear to cope. The initial alarm cycle recedes and the adrenals return to their normal size. However, the body is still over producing hormones and this puts wear and tear on all organs and makes fertile ground for inflammation and disease. Cortisol levels remain high. Here we are at the “I’m at my max” state of mind. Defense mechanisms and coping strategies all increase and we are ready to crack at the slightest event. 3. Exhaustion– If the stress still has not stopped, we enter exhaustion phase. Here our alarm reaction may reappear, with increased respiration and heart rate, sweating, etc., but we have no reserves to feed it. We are exhausted, depleted and often not thinking like ourselves. Our immune system is worn down; the heart and blood vessels are weakened. There is nothing left. In this final stage, the risk for disease and illness is the greatest, although as one advances through all the stages of stress, the body make break down from abnormal hormone levels and metabolic activity. But even more important, chronic will affect a person’s emotions, making all our personal relations strained.